As November draws near, most of the country is debating who will get to sit in the Oval Office; but over in a corner of the highest level of the American legal community, the fight is over who will get to stand before the Supreme Court to argue Carcieri v. Kempthorne on November 3. What's that case about, you ask? The short answer is who cares, but for those of you still reading this sentence the questions presented have to do with when the federal government can take land from states and hold it in trust for Indian tribes. In this case, the government took land from Rhode Island and gave it to the Narragansett tribe. Rhode Island and the affected town want it back and are appealing, supported by (apparently) every other U.S. jurisdiction in which Indians still have something worth taking. Much of the interest in the case has to do with federalism concerns. Possibly more interesting to you, though, is that the petitioners and their attorneys can't agree who will argue the case. The town wants its attorney, Joseph Larisa Jr., who has been handling the case for the last ten years. 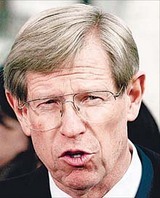 But the governor and the state AG's office want Ted Olson (left), the impressively-jowled former Solicitor General who argued for Bush against Gore. These kinds of disputes do come up but are typically worked out by attorneys acting like relatively grownup professionals, or, rarely, at gunpoint. But in this case the bickering and posturing have gone on for many moons. Under Supreme Court rules, each side typically gets just 30 minutes for argument and only one lawyer per side will be heard, unless the Court rules otherwise. In August, the parties actually filed a "motion for divided argument," but the clerk denied it, telling them to work it out. Larisa then proposed that the matter be settled with a coin toss. The others reacted with horror. "We don't think it's appropriate to engage in a coin toss with a part-time solicitor," sniffed full-time state spokesman Michael Healey. Accordingly, later that day the governor's counsel proposed two coin tosses. Under that plan, Larisa would flip with a representative of the governor's office, and if he won that one, would then flip with the AG's office. This plan, which had the virtue of being entirely unfair to Larisa, was rejected. Two weeks passed. On October 23, with pressure mounting, somebody called up experienced Supreme Court advocate Laurence Tribe to ask his opinion. His sage advice: coin toss. Actually, that was his fallback position. "The obvious solution," Tribe said, "is for Ted Olson to argue the case" because of his experience before the Court. "But if they find that unpalatable," he continued, "they [Larisa/the town] should flip a coin and grow up." Of course, they had been willing to flip a coin, but the state insisted they flip two. Then the state developed a new position: the dispute should be resolved the American way, by voting. "Democracy was an adequate enough framework to form the United States of America," said Healey, although you could argue it also took a couple of wars to do that, "[and] it should be an adequate enough framework to decide" this dispute. But since the state's democratic framework involved a vote of the three parties – two of whom wanted Olsen — it was not adequate enough to fool Larisa. This sent Healey back in front of a microphone. The town "is rejecting the democratic process and is saying it prefers a game of chance," he said. "The attorney general and the governor do not think there should be games of chance in Charlestown," Healey continued, although they were apparently okay with it if the rules ensured they would win. Which one is the American way again? The report also quoted Alan Gura, the 37-year-old lawyer who won the recent Second Amendment case in his very first argument before the Court. "The justices do not decide these cases based on personal relationship with attorneys," Gura said. "There is no substitute for knowledge of the record," which Larisa would have here and Olson would not. Therefore, in Gura's professional opinion, the course was clear: "I think they should flip a coin." Petitioners have until tomorrow to tell the Court who is going to argue. Link: "State, town can't agree on who argues tribal land case," Providence Journal (Oct. 9, 2008). Link: "Coin toss could decide who takes state case to high court," Providence Journal (Oct. 24, 2008).